You can directly feel their energy, but most of the time they want to crush their head against the brick wall. Energetic, optimistic, brave, keen, strong, chivalrous, vivacious. They are full of assertiveness, courage, action, the thirst for adventure and dynamism. Irascible, defiant, resentful, cantankerous, destructive, obstinate, obtrusive, aggressive, comparativeness, egoism and inconsiderateness. 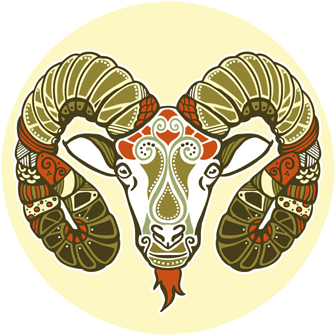 Keen energy and assertiveness is part of persons with ascendant Aries. They deal with problems without doubts and full of enthusiasm – and they want to reach their goals without detours. Indecision and irresolution are rare attributes. New and unexplored conditions appeal a special excitement. Inside them, there is to be found a spirit of a pioneer and adventuresomeness. They are discoverers without doubts towards spontaneity. They are inspired by their enthusiasm. In the case of neglecting their rivalry and competitiveness, they can be good motivators and team players for common development. They like to arrange for cooperative social issues. Together with environmental quests they perform and act. They are characters that communicate and provide new energy. Toward other persons, they are clear – structured as well – and open-minded. Those who are asking for advice will not be disappointed. Negative expressions of their outgoing personality are inconsiderateness and egoism - under these circumstances they can be offending as well. If they should recognize the achievement of their goals endangered, then their excessive energy actually could be running out of control, leading them to distrust and aggressiveness. So they would be turning to irascible and violent-tempered. Obstinately they look for the unpleasant confrontation. Descendent of Aries is Libra. Libra makes persons more considerable to the needs of other persons.